Here at Advanz Industrial, we strive to collaborate and work with highly reliable companies that have established their presence over the years by delivering quality products that stand the tests of time. Shawndra is one such name that Advanz is honored to be associated with. Shawndra is a leading manufacturer of OEM and replacement air and gas filter elements. Advanz serves as a proud representative of Shawndra Products, a brand that has been going strong in the industry for more than 30 years. They boast product placements at some of the major-energy, pipeline and chemical processing plants in North America and around the world. Shawndra has several laurels under its belt. It has developed the widest air and gas filter product line in the industry. They have also manufactured a plethora of highly trusted proprietary and patented products. To meet your need for pipeline gas applications, Shawndra offers a line of coalescers and filter separators that are approved by major gas companies like Kinder Morgan, NiSource, Nicor, Equitable Gas, and Ameren. Shawndra also offers custom designed Vessels and Housings that are certified and meet the PED, CRNs, Military Standards. We are proud of being associated with the company and bring their high-quality products to you. The innovative thinking and radical approach of Shawndra makes them a successful name in the industry. Their filter vessels are not designed to serve as merely an element to filter gas but to serve the filter companies. It saves hundreds of millions of dollars that otherwise goes wasted in the name of maintenance and support. Shawndra’s advanced R100 filter vessel technology boosts the uptime 25 times more than competitors. You get better quality outbound gas with the improved filtration process without increasing the cost involved. The filters can be changed by just one person, cleaned and re-used to ensure safer and cleaner gas with increased up time. The technology used by Shawndra’s filters is not new. It has been around for over ten years and successfully used by the major gas producers and pipeline operators around the world. Those who have used R100 are so satisfied with their experience that they never feel the need to get back to the old school. 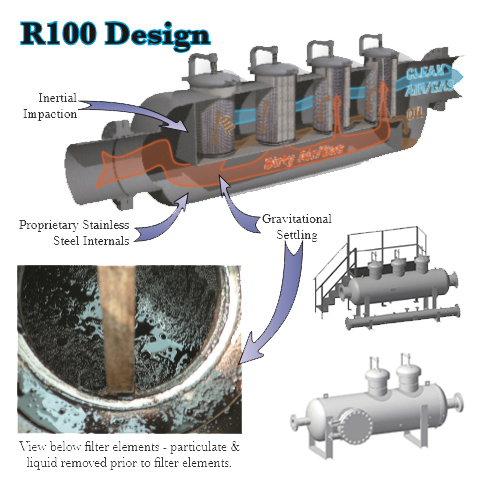 Apart from the R100, Shawndra also offers a variety of filter elements such as molded end elements, sewn end elements, panel filter elements, accordion filter elements, coalescing filter elements and custom design filter elements. They are named so based on their unique design and use in the filtration process. To order Shawndra products, request more details, or request an estimate, please contact us today. We look forward to hearing from you.